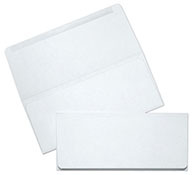 Remittance envelopes, also called Kost Kut envelopes, Remits, or Collection envelopes, have side seams and a large Wallet Flap which opens on the longest side of the envelope. This style envelope has a large printing area and is perfect for Collection purposes, Direct Mail, Donations, Church Offerings and Reply Mail. All Remittance envelopes are available with the option of being ordered Plain or with Printing.